Once again, this is a standard bourbon that I had not yet tried, and I felt that it was one that I needed to at least be familiar with. It's an inexpensive, readily available bourbon. I would otherwise hate myself if something great at a nice price were sitting there all this time and I never even knew it. 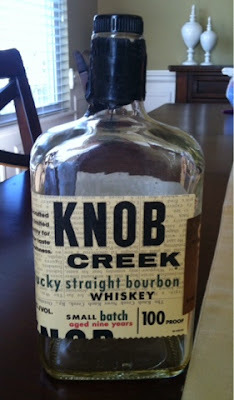 So, I gave the Knob Creek 9 year a shot. The first thing I noticed was the consistency. Frequently the darker whiskies are also on the thicker side. This one had a more watery consistency however. There were two distinct flavors that stood out, both of which were somewhat unique. The first was a distinct, lingering mint flavor. I didn't notice it up front, but it was definitely there at the back of my throat after each swallow. It wasn't necessarily good or bad; it was just there. The second flavor that stood out to me was cherries. And I'm not talking about that fake cherry flavor or the cough syrup flavor. I'm talking about the kind you pick off a tree and eat. It wasn't a strong or prominent flavor, but it was definitely noticeable, and something I really enjoyed about this bourbon. After having the bottle open for a few days, what had otherwise hit me as somewhat of a ho-hum bourbon improved, seemingly getting spicier, a black pepper kind of spice. I also tasted a distinct maple flavor that I had not noticed initially. It's not a complex or bold bourbon, but I would certainly consider it to be better than average, one I would certainly go to where choices may otherwise be somewhat limited.